Average Weight	: 37 - 62 lbs. A distant cousin of the Poodle and Briard, this French Water Dog with the webbed paws gets down and dirty in pursuit of waterfowl, earning him the nickname 'mud dog.' He real name comes from the French word 'barbe', meaning 'beard', due to his bearded face. The Barbet is not new to the Dog World ~ as we know the first written reference to the breed dates back to 1387, although the breed may have originated as early as the eighth century. For centuries the Barbet served as a water retriever for royalty and commoner alike, and his thick, waterproof coat helped earn him a reputation for braving the chilliest water. King Henry IV was one royal fan, and legend has it that the king's mistress was once reproached for bringing a Barbet to church. In addition to his retrieving skills, the Barbet is cherished for his versatility and his joyful, intelligent personality. In their of France this breed ranks among the top agility breeds and also loves to chase balls and flying discs. Barbets are considered to be a rare breed, with approximately 30 to 40 making their home in the United States and about 600 worldwide, but admirers of the Barbet hope others will come to share their love for this interesting dog. The Barbet breed is an integral part of dog history, and many familiar breeds have Barbet in their ancestry. Depending on geography and necessity, the Barbet connected through the centuries in various capacities, and as a companion dog, but more as an all-around working dog. The 'Grand Barbet' depicted in Count George Louis Buffon's book 'Histoire Naturelle' (1750) is thought to be the original source of the various water dog breeds (Poodle, Portuguese Water Dog, American Water Spaniel, and so on). Its actual origin is lost in antiquity but probably stems from corded herding stock. The Barbet has also worked as sailor’s assistants, much like the Portuguese Water Dog. It was best known for being a waterfowl retriever in the marshes, wetlands and estuaries of France which is where the expression "muddy as a barbet" came from in the 19th century. 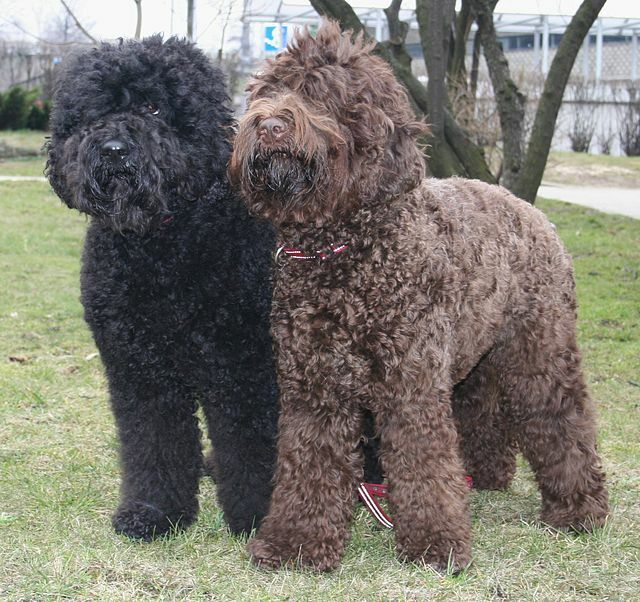 Between the late 18th to early 19th century the same dog was known as the barbet in France, the barbone in Italy, and the pudel in Germany; for almost a hundred years the barbet and poodle were considered one and the same. With the advent of dog shows and selective breeding based purely on aesthetics the poodle was developed to be more elegant and of a solid colour to distinguish it from its more common past. The versatile nature of the Barbet has meant its survival, and many of today's Barbet still have the assets attributed to them from the past and the Barbet origins and bloodlines can be traced back to the writing of the first standard in 1891. The breed is gaining popularity in Scandinavian countries and North America as more and more people are becoming interested in this all-around working dog or just as a pet. The Barbet’s personality is described as companionable, joyful, obedient, and intelligent. Very intelligent, this great medium sized dog learns quickly and would love a life full of obedience training. They are a great with children, families, and the elderly. Barbets will bond with their family and prefer to be in the same room with the family at all times. They need exercise daily to keep the dog in a healthy state of mind and body. They are capable retrievers for waterfowl hunting. In France and in Germany the Barbet continues to take part in field trials. This is a dog that loves the water and loves to swim. Make sure their coat is clipped so as not to 'drag them down' if you choose to enjoy water sports with them. The Barbet is know for their long, woolly, and curly coat. Their coats grow long and must be groomed regularly, otherwise the coat can become matted and the barbet may lose small tufts of hair like tumbleweeds. Like the Poodle ~ they require regular, professional grooming. The Barbet was developed in an array of colors, including solid black, brown, fawn, grey, pale fawn, white, red-fawn & pale fawn as well. Due to the extremely low number of Barbets in the world, little is known about long term health issues. In modern times, the first barbet, a male, was brought into the UK in 2001 although he did not reproduce. In 2007 two unrelated females were brought in from France having completed their period of quarantine and the majority of barbets currently in the UK are descendants of these. Since then, further examples of the breed have been imported from France, Holland, Canada and Poland. Several UK born barbets have been used in the breeding programmes of other countries and their offspring can be found in Holland, Switzerland, Germany, Sweden, Finland and Canada.